GearBest Double 11 Festival | Probably The Cheapest Vape Deals Ever! The Double 11 Festival also known as the Singles Day, is a holiday popular among Chinese people that celebrates their pride in being single. It is also an annual online shopping event just like Black Friday is in the western world. The Double 11 Festival has been held yearly from 2009 on the 11th day of the 11th month and it is considered to be the world’s biggest online shopping event. GearBest as the Chinese version of Amazon couldn’t be missing of course. So, when it comes to vape gear, from 10th to 14th of November they’ll be having 20 products for 1.11$ and 11.11$. The quantity will be limited so you’ll have to act FAST. Bookmark this page here and set a reminder. When the time comes: log in, add the item to your cart, click buy now and proceed to checkout. After that enter the coupon code, pay and you’re done. The deals are crazy. 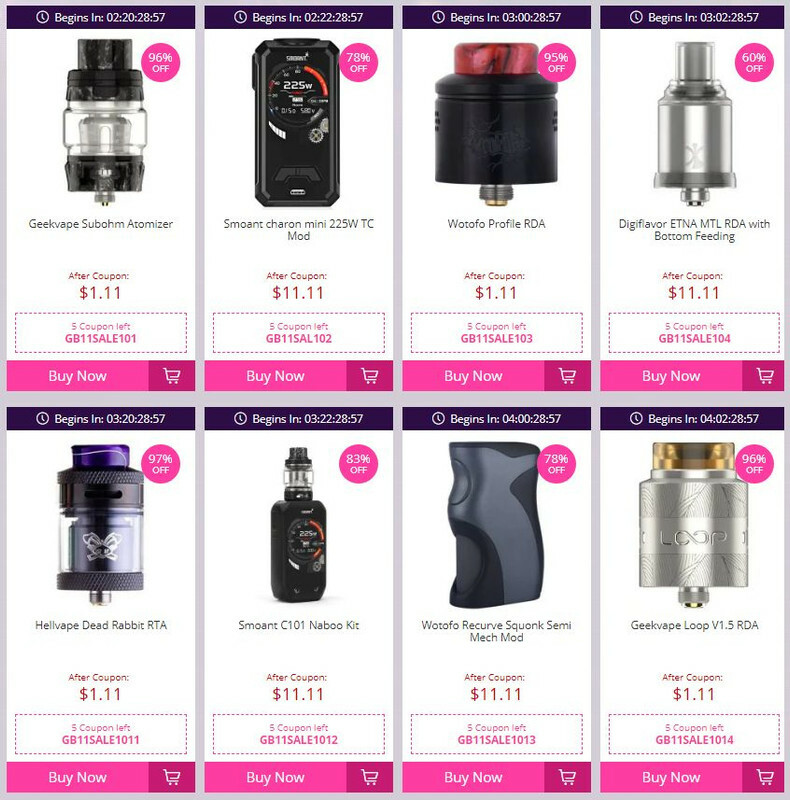 Categories: Vape Coupons, Vape Deals | Tags: GearBest Double 11 Shopping Festival | Permalink.